Article written by Mary Rita Crowe. 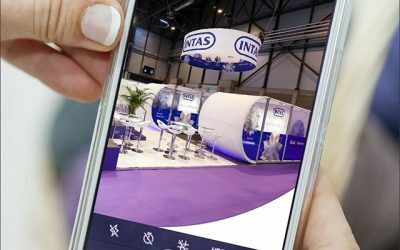 A staple of exhibition advertising is the banner stand, a simple concept that can make a big visual impact in your exhibition booth space and help your customers get a feel for your company in an instant. This incredibly versatile tool is an investment you need to make, even if your budget is tight. Banner stands can do much more than advertise your business at an exhibition, conference or other event; they can educate, inform, and entertain year round in a variety of ways. 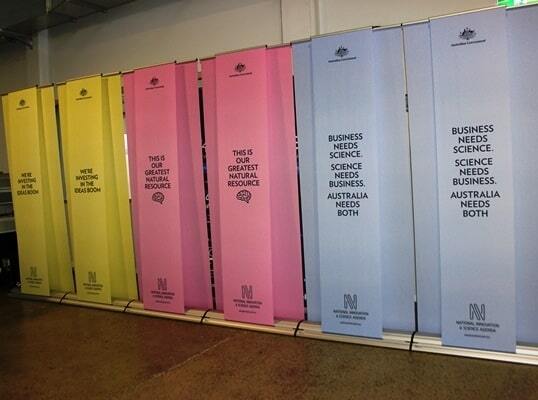 Here are 5 innovative ways to make the most of your banner stand investment between events. Take a look at your office lobby or reception area. What does it say about your business? The lobby or reception area is often the first impression for your customers, so it should be relaxing, welcoming and visually interesting. Rather than spending money on expensive décor, use your banner stand to bring some structure and colour to your “welcome” space. A banner stand can act as a visual anchor to the area, naturally drawing visitors and customers in to learn more about your products or services. Typically, the housing for a banner stand is the priciest part of the investment; the vinyl or fabric graphic is not only less expensive, but is also replaceable. Get more mileage out of your banner stand by printing a double-sided graphic or a second graphic to fit in the metal housing. Double-duty printing will give you flexibility with your banner stand; create different graphic messages for separate services, and then use them at different events, rather than buying two banner stands. Sales and discounts can be great, but as the saying goes, “you get what you pay for”. Cheap banner stands are inexpensive for a reason: they are often made from flimsy material, so they are more prone to break and bend and many inexpensive banner stands last less than two years. Investing in a better quality banner stand will save you time and money in the long run, especially if it’s used often for exhibitions and events. Imagine the embarrassment of setting up a cheap banner stand at your important event, only to watch it wobble and bend. Your brand is reflected in the strength of your image; make sure you are presenting yourself in the best possible way. Between exhibitions, use your banner stand to support other organisations in your community by sponsoring a local event and using your banner. Sponsorships are a great way to build positive public sentiment in your community, and showcasing your business through your banner stand at a public event will create top-of-mind awareness for potential customers. Sponsorships are often inexpensive, and can make a big splash. Think of your banner stand not only as an informative marketing tool, but also as a movable office. Standing out at an exhibition is similar to creating a welcoming and interesting space in your reception; it should draw customers in and make them feel welcome. Stand out among the crowd and attract more customers by coordinating your table throw with your banner stand. The combination will wow your customers and act as a welcome change from the standard show package. Mary Rita Crowe is a Chicago native and the sales manager at Skyline Exhibits Chicago. She has been in the trade show industry for almost 12 years working with distribution networks nationwide and provides her clients with Chicago trade show displays and solutions.